That really forced me into a career moment of, ‘okay, I’ve put myself in a position where I should be a good candidate — should I apply?’ And the easy answer for me was yes. I’m happy to lend my talents and my efforts — and it’s a lot of effort — to help the system make the transition. I’m very excited about it. We’re sorting that out, because that’s not an inexpensive decision to make. It’s not an inexpensive commitment. And as you move forward in population health, there’s a whole lot of other technology that needs to be deployed. I haven’t heard anyone in years say that this is not the future of healthcare and this is not where we are going. It is where we’re going, and everyone’s trying to figure it out. Gamble: Hi Dave, thank you so much for taking the time to speak with us today. Lundal: Happy to be here. Gamble: To lay the groundwork, can you talk a little bit about Presence Health — what you have in terms of hospitals, ambulatory care, things like that? Lundal: Sure. Presence Health is the largest provider of healthcare in the City of Chicago, with about 22,000 employees, 12 hospitals, a medical group, nursing homes, rehab facilities, skilled nursing, home care — we pretty much the gamut of healthcare delivery. We also have a very pretty innovative group we call Presence Health Partners which is our accountable care organization, and that’s our clinically integrated network as well. That’s going to be a group that’s going to be quite fun to work with as we look to make the transition from fee-for-service to the value world. Gamble: That’s definitely something we’re going to want to get into. What was the number of hospitals you have? Gamble: Twelve. Okay, that’s a pretty nice-sized system. And you’ve been CIO there since this past summer? Lundal: July 7 was my first day. Gamble: Previously you were at SSM. What was it that brought you to Presence? What was it about this particular role that seemed interesting to you? Lundal: At SSM Health Care, I had a hybrid role where for part of my job I was the CIO for Dean Health System, but for the other part of my job, I was the regional CIO for SSM Health Care. I reported to the CIO for SSM Health Care who was in St. Louis. A couple of things happened. One is that SSM completed an acquisition of Dean Health System, and so I became fully a regional CIO. Even though I had quite a big job because I was responsible for Dean Clinic and I was also responsible for the information systems at Dean Health Plan as well as what we were doing at the hospitals, and we had and still had a joint venture technology company in Wisconsin called WITTS which was an LLC between Dean Health System and SSM Health Care that went back to 1999, and we did quite a bit of work there. I was still in a regional role — kind of a number 2 role. So I was working through that and everything was still fine. But then my boss in St. Louis made the decision to retire. That really forced me into a career moment of, ‘okay, I’ve put myself in a position where I should be a good candidate — should I apply?’ And the easy answer for me was yes, I should apply, and so I did. But shortly after I had made that decision and was waiting for the process to kick off with SSM Health Care, I was informed about the position at Presence Health and encouraged to take a look at it. I was very happy to move forward on the SSM path, but at the end of the day, you think you’re in a good position and it doesn’t always work out. And so I thought about the timing of both — when the Presence position would be open and when the SSM position would be open lined up pretty well, and I said, all right, it’s okay to be in two processes, and let’s see what happens. As it turned out, the Presence process moved very rapidly where the SSM process did not. In fact it’s still not filled, although I believe they will be filling that soon. And so I found myself in a position of having a job offer from Presence when the process had not really started yet from SSM. I had to take a look at Presence and what I found was a lot of familiarity. It’s a Catholic health system and I’ve been in Catholic healthcare since 1995. It’s Chicago; it’s the Midwest, and I’ve spent much of my life in the Northern Indiana, in the South Bend area, and a little bit of time as a youngster in the Chicago area and up in Madison, Wisconsin — all in this area. That was very familiar to me, some comfort there. It gave me the chance to be the lead IS person in a health system, which is something that I had put myself in a position to be and I wanted to give it a try. But also, I mentioned a few minutes ago about Presence Health Partners being our clinically integrated network and our accountable care organization. One day, it may be a health plan. But the story I was told related to Presence is that we want to go two feet in the canoe. We want to go full forward on making the transition to value-based care. At Dean Health System and SSM Health Care Wisconsin, we were an integrated delivery network, and 40 percent-plus of our business was at risk in a full-capitated model and we had accountable care organizations. I was doing IT between the clinic and hospital and health plan, all centered around the idea that patient is the center of the universe, and had lots of experience related to the new economic model when your economic model is not ‘just produce more widgets,’ as it is in a fee-for-service world. I know I’m completely understating what that widget is in healthcare, because it’s a very, very complicated and important widget. But still it’s a volume transaction, and so all those things lined up and I thought I could make a difference here at Presence. All of those things came through and I decided to accept the offer and make the transition. Gamble: Of course it’s still relatively early on, but so far has it validated for you that you made the right decision? Lundal: Absolutely. I was looking for a challenge and I have a challenge, but it’s a very good challenge. I’m happy to lend my talents and my efforts — and it’s a lot of effort — to help the system make the transition. I’m very excited about it. I’m very happy. Gamble: Let’s get into some of those many priorities. First, what’s the clinical application environment at Presence? What systems do you have in the hospitals? Lundal: In the hospitals, we have two systems. 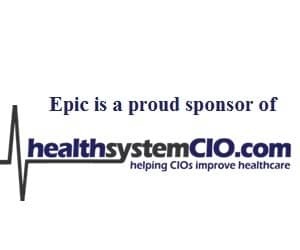 In half our hospitals we have full Epic, and in half the hospitals, we have Meditech. At our medical group we have Epic fully deployed. Gamble: Is the goal to get all the hospitals on Epic, or is it something that’s not necessarily on the radar? Lundal: Certainly it will be ideal to have one patient database. Going back to my previous job, ‘one patient, one record’ was the motto. One patient, one record anywhere anytime, and I don’t have that. We don’t have that right now. In fact, we have not only Epic and Meditech, but there are six different Meditech databases. That creates a lot of transactional friction. It creates a lot of challenge presenting one patient view. There’s not always overlap with the patients. A patient downstate may not be seen in Chicago, and so it’s not always an issue, but still it’s ideal to have one patient record. Whether or not that’s a priority, we’re sorting that out, because that’s not an inexpensive decision to make. It’s not an inexpensive commitment. And as you move forward in population health, there’s a whole lot of other technology that needs to be deployed. One of the things we’re going to be sorting through is, is that a priority right now? Do we need to move there, or do we need to do other things? As I look at it, we can take all of the data from the different EMRs and get them into a unified view for analytics, and analytics is a really critical piece now going forward. If I can do that — albeit it’s harder to do, but I can do that — maybe the effort needs to go there first rather than unifying our transactional systems. Gamble: Let’s talk about the Accountable Care Initiative and what’s going on there. It sounds like that’s something that’s definitely a big focus for you guys. Lundal: It is. Fee-for-service is a challenge, and we all know what’s going on in terms of reduced usage of health systems. The reimbursements rates are either being flat or reduced quite a bit. We know they are in the Affordable Care Act and other places, and getting into the broader picture, I’ve always heard of how large a chunk of GDP healthcare represents. And know it’s going to be flatter or go down. We have made the strategic decision here that we want to go at-risk. We have a Medicare Shared Savings Program. We are going to be working in the Medicaid Accountable Care Entity — Medicaid ACE — here in Illinois, and Presence is the largest provider of Medicaid in the State of Illinois. We also have some multiple different commercial opportunities we’re working on with payers to get to risk, with the goal of hopefully one day having as much risk being fully capitated as we possibly can. That’s a transition for any healthcare organization, but I haven’t heard anyone in years say that this is not the future of healthcare and this is not where we are going. It is where we’re going, and everyone’s trying to figure it out. And we’re certainly there. I’m excited, and when I talk to my staff or people that work with us in IS and I describe it and I give a little bit of the economics of it, I always end up talking about just how good it feels to be an IS professional these days because the kind of things that we’re getting into in technology are things that improve care. If it’s a technology that helps people avoid a hospital admission, that’s a really good thing. And so the alignment I think is really nice. Plus, it can get us to some fun and cool things to do in IT. Gamble: Right. In terms of being able to do things like analytics for population health, where do you stand at that point? Lundal: We have partners and we have some good claims-based work underway where we have a significant gap that we need to close out. We will be working aggressively towards this in 2015 and 2016, is on in clinical-based analytics — the gaps in care type of reporting, getting much deeper in terms of predictive analytics and risk stratification. I think for some part we’re there, but we have a lot longer to go in terms of using clinical data in this regard.